For Aircraft with General Aviation Style, (dual jack) connections. "Of all the cellphone to headset devices, CellSet delivered the best overall quality and performance." 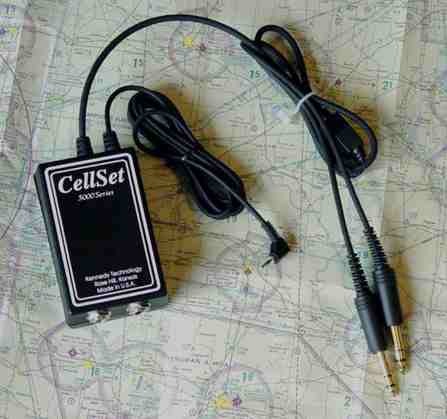 "The CellSet performed flawlessly... easy to use and generally outperforms the other two entries." First and foremost... no installation is required! Connect your stereo or mono headset to CellSet and plug CellSet into your intercom or radio. Then plug CellSet's cellphone cable into the headset jack on your phone*. Use your radio/ICS system as you always do. When there's a phone call, CellSet "wakes-up", significantly amplifies the cell phone's audio and ports it to your headphones (of course, talk on the phone through your boom mic.) Even if your radio or intercom is inoperative, CellSet will still let you talk on the phone. When the call ends, CellSet goes to sleep. While sleeping, it draws only about 20 µA of current, so you can expect nearly 2 years of standby time or 30 hours of talk time from a single 9 Volt transistor radio battery. UNIV - For phones with a universal, 2.5 mm diameter, three conductor headset jack. This includes all Motorola, most Sanyo, Samsung, and Kyocera phones. Many Ericsson and Nokia phones do not have this connector, but may use an adapter to connect to this CellSet. NOK4 - For Nokia Phones that list headset item HDC-5P (2.5 mm, four conductor connector) as an accessory. Not compatible with other phones via adapters. SR22 - For Samsung R225 and R229 phones ( 2.5 mm, four conductor with outer ring). Not compatible with other phones via adapters. HS830 - For use with Motorola's HS-830 Bluetooth adapter. Cost: $219.95.00 plus shipping. 30 day money-back guarantee! *CAN'T FIND A HEADSET JACK ON YOUR PHONE? We may have an adapter to suit your needs.